I hope everyone is having a lovely break for Easter and starting to feel a little renewed. I thought that today would be the perfect time to bring you a post on Karma Yoga and what it means to me. 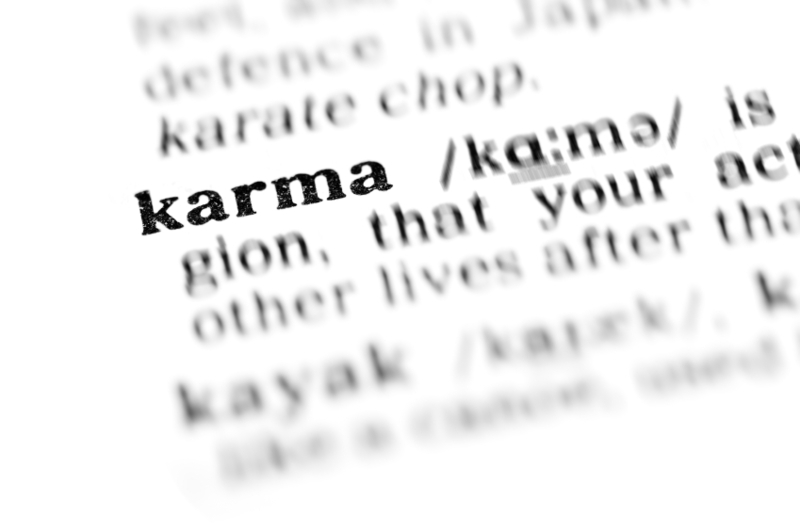 Most of us have heard of karma and can often relate it to the phrase “What goes around comes around”. However have you ever considered how karma really affects your life and how what you are doing right now is creating karma? 1. Sanchitha Karma – this is all accumulated karma from the past, including all past lives. So you could say this is everything that has happened in the past and has been stored in the memory of karma. Effectively, everything you have done in the past is stored up and affects what is happening to you right now. 2. Prarabdha Karma – this is the part of Sanchitha Karma that directly affects you right now. It determines your current experiences based on the past. So you could say that this type of karma is the fruition of past actions. 3. Agami Karma – everything you are doing right now will affect what happens in the future of this life and future lives and this form of karma refers to the future. Effectively it says that everything you are doing right now will have a direct affect on what happens to you in the future. So the question really needs to be what can I do about karma and how does that come into yoga? Well the first thing to accept is you cannot change Sanchitha Karma as that is everything that has happened in the past so you need to forget it and let it go. The only thing you can directly have an influence on is Agami Karma and what happens to you in the future as that will be directly impacted by what you do right now. Someone who is practising karma yoga is always practising it, this should not just be done for a small amount of time but with every action and thought that you have. When you first hear this, if you are like me, the first thought that goes through your mind is how can I possibly do that? The answer is intension, we are human beings and so by nature we are not perfect however if your intension is to do no harm then we are doing the right thing. A person who practises Karma Yoga goes through life with the aim to serve others, whether that be humans, animals or other living creatures. They will try in inflict no pain and suffering on these beings through their actions but also through their thoughts. When looking for people who embody these qualities it can be quite difficult in this competitive, materialistic world but the first person who comes to mind is His Holiness the Dalai Lama. Ok, I know that this is a very high ideal to aim for but if we know where we are heading we know where we are on the journey as that is all part of it and maybe in this life we will not achieve it but maybe our actions in this life will prepare us for this sort of attitude in our next life or one further in the future. 1. Eat a Vegan Diet – Part of Karma Yoga is to not cause any pain or suffering to another living being and this includes animals. Under no circumstances should a yogi eat meat, the question of dairy and eggs needs to be one you contemplate yourself but if you were to learn about and understand the industrial farming techniques to bring you these foods you would realise they cannot be acceptable either. 2. Eat a Natural & Organic Diet – If you are practising Karma Yoga then you should also be concerned about the planet as that is essential what we are part of and what provides the life force for all living creatures. So as a result you should consider the damage that you food does to the environment. 3. Recycle & Use Natural Cleaning Products – this would include all of your cosmetics and cleaning products for you and your belongings. This again is related to the damage that can be done to the planet. It is now becoming easier and easier to get natural products that will not damage the environment and so your best effort should be made to serve the planet. 4. Do Not Hold On To Harmful Thoughts for Others – this includes all other humans, animals, plants, minerals or anything. The main reason for this is that karma is not just created by actions but also by thoughts and so any unpleasant things you think will come back round to you in the end. When you find yourself thinking something mean, stop yourself and consider the fact that the other person, animal etc is also part of the same higher power than you and is acting from their own past karma. 6. Do not Sanction Abuse or Torture of Others – this is quite self explanatory, but you do not have to do an action to someone to cause them pain. Instruction or supporting others that do is just as bad and create just as bad karma for themselves as if they had done the action themselves. Someone practising Karma Yoga would not want to see others suffer. 7. Do Not Physically Hurt, Abuse, Torture or Kill Another Being – this does not really need any explanation. The above 7 points are not like rules as in many religions they are just my guide to karma. You will not be punished if you do not do the things I recommend but they may affect the outcome of things in this life or in the future. The only other thing I want to mention is intention and this is very important and something I touched on earlier. One of the things in karma yoga is to not cause suffering but I think there needs to be some emphasis on the intension behind an action. For example you may perceive someone struggling and offer help. However the help you offer may upset the person as they did not want it and this may cause them pain. It is important here to remember your intention here. If you offered to help someone as you thought it would be a good thing for them and your aim was to do good and to serve then you are in a good place with karma. You cannot control the reactions and emotions of others but you can control your intentions. Always refer to your intention if you are unsure if it is to be kind and not cause pain then you have made the right choice. This article is only a brief outline of the principles of karma yoga very much from my point of view and my own interpretation. If you are interested in this subject then I would recommend reading as much about the area as you can, you can never know too much where yoga is concerned.